The 2010 has been the year of Venter's synthetic genome. What about 2011, new developments at the horizon? A comic appeared on Nature in 2004. Synthetic life? Venter's cells were not completely synthetic as only the DNA was artificially made. 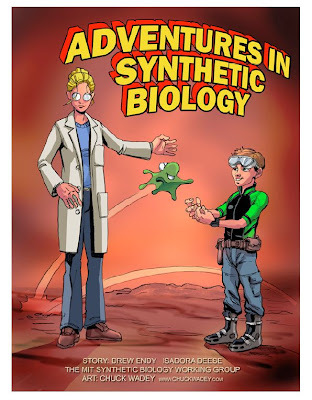 But, is it possible to build a fully synthetic cell? Some progress come from an unexpected approach: synthetic inorganic life. Despite the strong claims of bacteria substituting phosphorous with arsenic in their DNA have been largely criticized, the research of inorganic life continues on different fronts: for instance, the group of Lee Cronin (University of Glasgow) is trying to create self-replicating, evolving, inorganic cells that would essentially be 'alive'. Simple inorganic chemical cells (iCHELLs) can be obtained at the liquid-liquid interface between aqueous solutions of POM (polyoxometalate) clusters and coordination-complex cations with the aid of very simple instrumentation. The researchers placed a drop of cation solution on a glass coverslip and POM solutions were then injected into the droplet using Eppendorf femtotips. The process can be nested resulting in compartmentalization of internal membranes that were found to control the passage of materials and energy, meaning that several chemical processes can be isolated within the same iChell, just like biological cells [Angewandte Chemie Int Ed, 50(44); 10373-76; 2011]. Future steps under investigation are the engineering of iCHELLS able to undergo fission into daughter iCHELLs, just like inorganic life. For the moment, a second in vitro study lead by Laura Martini and Sheref Mansy shows that cell-like systems with riboswitches can be used to control protein expression under fully defined conditions in water-in-oil emulsions [Chem Commun 47; 10734-36; 2011].